Image caption Tottenham Hotspur says the Olympic Stadium "doesn't work for football"
Tottenham Hotspur FC has confirmed it would demolish most of the Olympic Stadium if it won the bid to take it over after the 2012 Games. Stadium architect David Keirle said the club would use its own money to redevelop the stadium for its use. Tottenham Hotspur and West Ham United have both submitted bids to occupy the facility after the Olympics has begun. The Olympic Park Legacy Committee (OPLC) will recommend who will take over the stadium by 28 January. The decision will then be agreed by London mayor Boris Johnson and the government. Tottenham said it would demolish the stadium because it feels the venue is not suitable for football with seats being too far away, for example. Architect David Keirle said: "It's not entirely demolition. We will be using some of the undercroft (cellar) but we're not using much. "We may be taking some elements to Crystal Palace for its redevelopment." He said it would be an easier and cheaper solution for Tottenham to go to the Olympic Stadium rather than redevelop its ground White Hart Lane, as the club would spend about the same but get more for its money. Spurs playing away from home? If West Ham wins the bid, it has offered to reduce the 80,000-seat venue in Stratford, east London, to a 60,000 capacity after the Games. It would cost the club between £150m and £180m to convert the venue by extending the roof, creating a pitch, turnstiles, toilets and space for corporate hospitality. It would borrow £40m from Newham Council. The chairman of UK Athletics, Ed Warner, said Tottenham Hotspur's proposal was "completely lacking a tangible Olympic legacy". 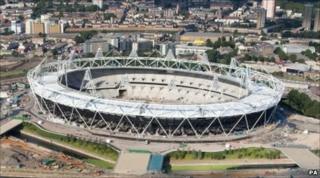 "Instead they have confirmed their intention to demolish the Olympic stadium. "The promise made by the London 2012 bid team in Singapore in 2005 was for an athletics legacy in the stadium, and the global athletics community expect this promise to be kept."